A totally unique and enchanting property with so many interesting design features it's impossible to list them all. Children & adults alike will delight in discovering new quirks and magical eccentricities hidden in the details of this amazing home. If Harry Potter could choose a magical place to holiday, it would probably be The Dragons Nest! The Dragons Nest name was inspired by the two baby dragon sculptures clinging to the chimney stack and that pretty much sets the tone for the seductive interiors of this 'one of a kind' property. Many of the wooden features and internal doors are handmade from reclaimed boat timbers. See how many you can find. Please click the 3D tour button to fully understand the layout and design. Enjoy magical meal times in the open plan kitchen diner with it's huge fireplace & hearth. Who will claim the unique Captains Cabin sleeping area? 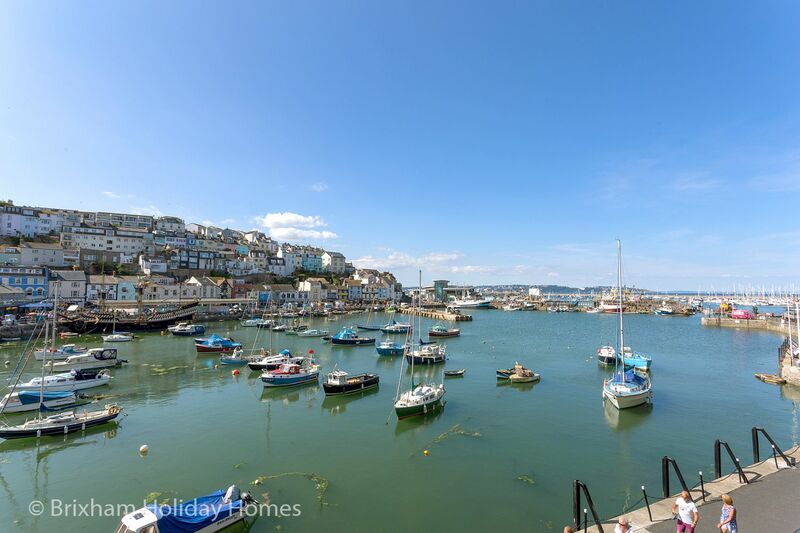 The accommodation briefly comprises a large open plan lounge / kitchen / dining area on the ground floor with a huge open fire place and views over Brixham Harbour, cloakroom w/c. Door to rear storage area with washing machine and tumble dryer and storage for bikes and kayaks etc. 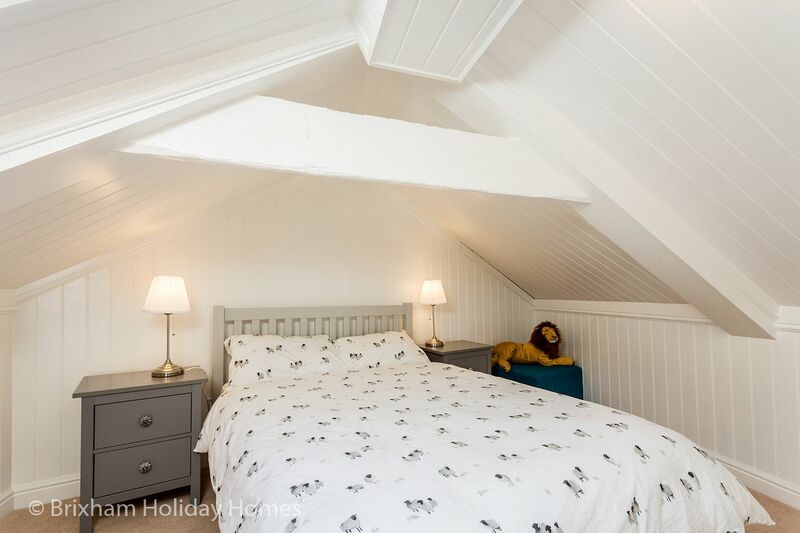 On the 1st floor is a large family bathroom with roll top bath, separate walk in shower, wash basin and w/c and a large lounge with sofas, TV, Hi-Fi system, lots of toys, games and books and views over the harbour. The 2nd floor hides the wonderful enclosed Captains Cabin sleeping area and has the large master bedroom with masses of built in storage and majestic views over the inner harbour and out to sea. Finally, the open plan top floor has a double bed, double sofa bed and a pull out single bed as well as an separate w/c and wash basin. Outside and up the steps is the secret terraced garden with benches from which to admire the spectacular view. Short breaks available most of the year except the peak summer holidays when its week only lets starting on a Friday. Dogs very welcome - lucky Rex! Door to rear covered storage area - washing machine & tumble dryer, storage for surf boards, bikes etc. This leads to an elevated lawned garden with views over the harbour, the perfect place to enjoy a picnic or to watch the sun go down. A unique place to stay..interesting with amazing views over the harbour. Amazing house, amazing location. Not much else to say, it was perfect for our needs. Would definitely recommend. Set in a commanding central location on King Street, this substantial 4 story house enjoys unobstructed views across the harbour and out to sea. 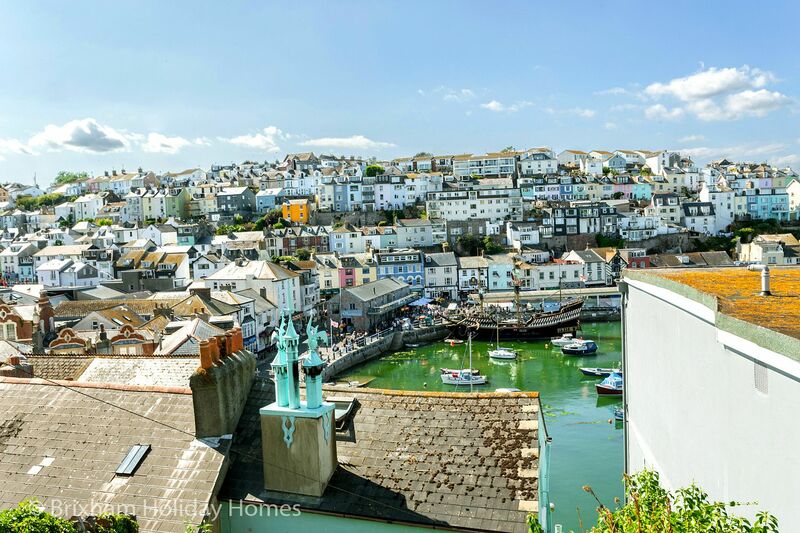 Less than a minutes walk to the pretty harbour side with it's many shops, restaurants, cafes and bars. Take coastal walks, swim at Shoalstone outdoor pool, go crabbing or enjoy the freshest fish & chips from Brixham's world famous fish market.